last year, google introduced their street view feature, and i spent a few days virtually wandering the streets of san francisco, looking for bizarre glitches. google street view is essentially a street-level view of the city, achieved by driving a customized van with funky cameras on its roof throughout the city streets. the cameras on those first san francisco vans were vulnerable to two types of glitches. there were solarization errors, where the images were corrupted by too-bright sunlight. and there were stitching errors, because the panoramic images were "stitched" together from multiple camera lenses, and things didn't always match up. 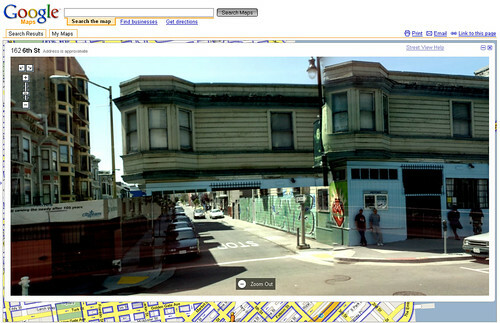 since then, a lot more cities have been indexed into street view (including indy), and the tech has improved. the new cameras are truly panoramic, so there are no stitching errors, and they're not as sensitive to bright light, so solarization glitches are minimized. the street view of indianapolis, for example, has occasional glitches, but most of the major ones are mapping errors, where the data from the camera doesn't match up to the maps quite right.